Many of people make resolutions to eat healthy. However well intentioned, something will always get in the way. If you are always on the go, working, shuttling children or running errands things will often take longer than expected. You may not have time to cook and will need to look for food to grab on the go. Can you find healthy fast food options or is that a myth? Planning and organization is the key to healthy eating and if you plan before you go to a fast food restaurant, you will know ahead of time what to order. In order to successfully find healthy fast food options, we need to be armed with knowledge. We all need the big three; carbohydrates, protein and fats. A healthy diet will have all 3 components; however the type of carbohydrate, fat and protein you pick is essential to maintaining good health. Fats that are inflammatory such as meat, dairy, trans fat, hydrogenated oils and saturated fats should be limited. Choose more “fats that flow”, that is anything that can be made into an oil such as fish, olives, nuts, avocado and seeds and any of their oils. Carbohydrates are best if they are not starchy or processed so whole fruits and vegetables are best. Limit the starchy carbohydrates such as rice, pasta and potato. Protein will either be packaged with a carbohydrate such as beans or a fat such as chicken or other animal product. Choose a less saturated fat animal product such as fish or chicken as opposed to sausage or red meat. A balanced diet consists of approximately 40-65% carbohydrates, 20-35% fat and 10-35% protein. A low carbohydrate diet will have 40% carbohydrate, 40% protein and 20% fat. With this knowledge, we can successfully navigate fast food and select healthy fast food options. If your daily caloric intake is 1800 calories, then your food intake should consist of 200 – 300 g carbs, 45 – 157 g protein, 40 – 70 g fat and 28 g of fiber. If you are on the high range of multiple food groups, you’ve consumed more than 1800 calories. If you weigh less, your caloric intake should be less. Using the previous parameters, keeping lunch at less than or equal to 500 calories, with about 10 -20 g of protein, with no trans fats, and moderating sugar, starch and sodium; you can find healthy fast food options. The keys to finding healthy fast food options are to focus on grilled or roasted protein sources; eliminate sauces, dressings, and condiments; skip the bacon; moderate cheese and dairy products; be wise regarding sides; and avoid liquid calories. In many instances; the sauce, dressing or condiment, turns the healthy fast food option into an unhealthy one. Although it would be best to eliminate them completely, you can have the sauce or dressing or condiment on the side and use sparingly. Or add your own extra virgin olive oil and herb flavored vinegar or lemon with fresh or dried herbs or spices. 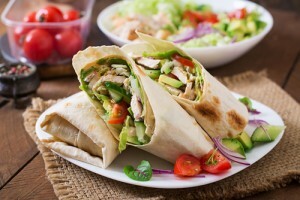 Some possible healthy fast food options include salads at almost any fast food restaurant or a supermarket salad bar. Many supermarkets offer grilled chicken breasts or steamed shrimp as a protein source as well as grilled, steamed, roasted or sautéed vegetables or raw vegetable salads. Salads have the vegetables and protein but you need to be careful with the amount of sugar and fat which are mostly due to toppings and dressings. Ask what they use for dressings and become familiar with your local options. It will be easy once you have selected options that can become staples. If your local supermarket does not have any ready-made healthy fast food options, a chain restaurant may have some. At Chipotle restaurants, the best healthy fast food options are a burrito bowl or salad. Be sure to skip the rice, sour cream, cheese and corn but include guacamole for healthy fats; fajita vegetables, salsa and beans for increased fiber and flavor. Chic-fil A was one of the first fast food restaurants to offer a trans fat free menu. Their Grilled Market Salad is a healthy choice or grilled chicken nuggets with a superfood side. If you skip the bacon and blue cheese, Wendy’s Strawberry Fields Chicken Salad is a good choice or try their Asian Cashew Chicken Salad. Salads also come in half size. Their Power Mediterranean Chicken Salad is also a good choice. The Cheesecake Factory has a “Skinnylicious” menu. My favorite is the Seared Tuna Tataki Salad. Just don’t look at the cheesecakes to avoid temptation. Healthy fast food options if you don’t need to be gluten free, at Subway are the 6 inch Veggie Delight Sandwich, 6” Oven Roasted Chicken or Turkey Breast are the lowest calorie and healthiest choices. Or skip the lunchmeat and have a sandwich loaded with vegetables topped with a small amount of olive oil and vinegar. Burger King has a veggie burger with fresh apple “fries” on the side WITHOUT the caramel sauce or the Garden Chicken Salad with limited dressing. Either of these would fit the parameters of a healthy fast food option. There are many healthy fast food options in Starbucks including Bistro boxes, black bean salad bowl, hearty veggie and brown rice salad bowl. or sour cream are additional healthy fast food options. Many fast food restaurants use dressings that have gluten, sugar, high fructose corn syrup or other unwanted ingredients. If possible, use your own or just use oil and vinegar or lemon and oil. Planning and organization are the keys to successful healthy eating. It is always best to eat foods that are home made from known and reliable healthy single ingredient foods. However, even the best laid plans sometimes run amuck. When that happens, you can choose healthy fast food options. A functional medicine doctor can work with you to develop goals and strategies for healthy eating, and weight loss. Functional medicine doctors can also determine if you have any nutritional deficiencies. If you do, a functional medicine doctor can help you adjust your diet to amend those deficiencies.